A Province Of The British Colony Of The Straits Settlements, consisting of the island of Singapore, and about 50 islets S. and E. of it in the strait of Singapore, lying between lat. 1° 8' and 1° 32' N , and lon. 103° 30' and 104° 10' E.; pop. in 1871,97,111. The island of Singapore lies off the S. extremity of the Malay peninsula, from which it is separated by a strait about 40 m. long and ½ to 2 m. wide; it is about 25 m. long from E. to W., and 12 m. wide; area, 224 sq. m. On the coast are swampy tracts covered with mangrove trees, but inland are many small hills, from 100 to 500 ft. high. Iron ore abounds. Much of the soil is sterile, but in the lowlands it is richer. There are a few rivulets. Nutmegs, cloves, ginger, pepper, gambir, tapioca, and sugar cane are raised. The thermometer ranges from 71° to 89°, and the climate is healthful. Showers are frequent, and in 1871 the total rainfall was 120.4 inches. Tigers cross the strait to the island, and are said to carry off, on the average, a Chinaman every day. Of the inhabitants of Singapore in 1871, 74,351 were males and 22,763 females; 54,098 Chinese, 19,250 Malays, 9,297 Klings, 1,329 Europeans, 2,164 Eurasians, and the remainder natives of other parts of the East Indies. Malay is the prevailing language. 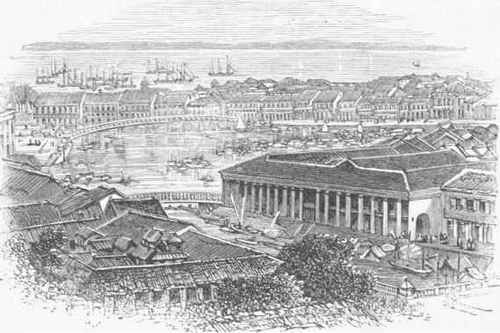 A City, capital of the Straits Settlements, on the S. side of the island of Singapore, in lat. 1° 16' 13" X., lon. 103° 53' 15" E.; pop. about 90,000. It is on a low plain fronting the harbor, with hills in the rear, and is intersected by a salt-water creek called the Singapore river. On the W. side is the Chinese quarter, which contains also the great mercantile warehouses and counting houses. On the E. side are the official buildings, churches, hotels, and many of the European residences; and still further E. is the Malay quarter. Behind the Chinese quarter, on Pearl hill, is a fortress which commands it, and on another elevation, back of the European quarter, is the government house. a fine building of cut stone. Many neighboring hills are occupied by country houses. Near the shore are ample parade grounds and drives. The botanical garden has a splendid collection of tropical plants. Among the public buildings are the Singapore institution for the study of the languages of the East, which contains a museum, library, and reading room; a prison, in which are generally confined about 2,000 criminals, mostly Hindoos, who are employed on government works; Protestant and Roman Catholic churches, a splendid Chinese temple, and a Mohammedan mosque. There are two mission schools, attended chiefly by Chinese, Malays, and Eurasians. The Chinese have also private schools. The port of Singapore, which is divided into two by a tongue of land, is capacious, and the water is deep enough for the largest vessels. The harbors are provided with every facility for an extensive commerce, and for fitting out and repairing ships. Singapore is a free port. Vessels pay three cents a ton light dues on entering and leaving. In consequence of its geographical position, it is the entrepot of the commerce of S. Asia and the Indian archipelago, and is resorted to by vessels of all nations. The entrances in 1872 were 1,665, tonnage 918,652; 729 were steamers, tonnage G12,929. The total value of imports was $43,415,383; exports, $39,020,-121. During the year ending Sept. 30, 1874, 29 United States vessels entered; the total value of the exports to the United States for the same period was $3,750,831. The exports are tin, gambir, pepper, rattans and Malacca canes, coffee, nutmegs, tapioca, sago, caoutchouc, gutta percha, sapan wood, buffalo hides, and gums. - The city of Singapura ("lion's town"), capital of a Malayan kingdom, occupied the site of Singapore in the 12th century. In the 13th century it was captured by a king of Java, when the royal residence was removed to Malacca, and it gradually fell into decay; and in 1819, when the British built a factory on the site, the whole island had only 150 inhabitants. In 1824 the sultan of Johore, in consideration of $60,000 and a life annuity of $24,000, transferred the sovereignty and fee simple of the island, and all the seas and islands within 10 geographical miles, to the British. (See Straits Settlements).